Because you asked for it (well, @kevbot217 did on Twitter), here’s the natural follow-up to the post about Foggy’s mustache: Foggy’s tattoo. Apparently, the mustache wasn’t edgy enough, so he had to go for the more permanent statement of getting a tribal tattoo more commonly seen on 20-year-olds. Was it deep enough to stay in continuity? I’m not sure. When we see Foggy shaving in Daredevil #82 (vol 2), only his right arm is visible. These panels, from Daredevil #59 (vol 2), by Bendis and Maleev, are part of a longer scene that is quite funny, also featuring Matt’s “It’s red? I thought it was yellow” joke, which I’m sure those of you who have read it remember. Yeah, I love that line. Is it a tribal tattoo or barbed wire? The latter would certainly be more in line with Franklin Nelson’s status as the Marvel Universe’s #1 badass. Either way, I think it’s probably one of those washable tattoos that little kids get, or perhaps henna. What’s amazing is that I never noticed this before! Hooray! I believe we saw it one more time, but I can’t place where. Barbed wire totally makes sense, actually. I’m holding onto the belief that it’s totally a permanent tattoo. 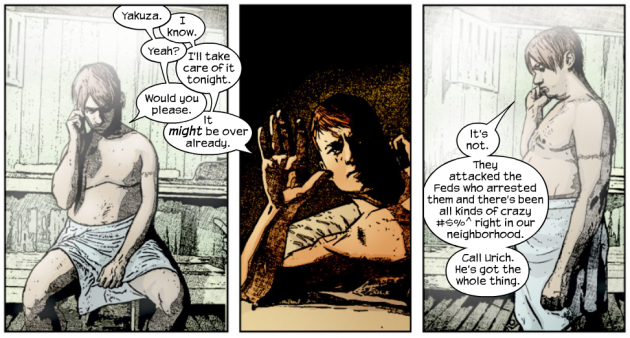 And that Bendis and Maleev did it because I wrote a letter to them telling them I wanted to see more of Foggy shirtless. On the other side, the barbed-wire tatoo seems to stress Foggy Martyr status as Matt/DD’s long-suffering pal… Anyone besides me is reminded of a cilice? Wow, that’s some Catholic subtext for ya! Maybe you’re right. By the way, I added a neat new feature to all panels so that, if you click the image, you a close-up of it for even more Nelson goodness. Click the image again to reset. Pretty cool, huh? No doubt, Foggy, Porkchop Peterson, and other Omega Deltas ran wild over campus yelling that cheer at the top of their lungs and ended up making some questionable decisions. Hence, the tattoo. I rest my case.